While it is relatively simple to identify the owners of this historic property in the public records, it is not so easy to discover the names of the tenants who leased the property from owners who resided elsewhere. Fortunately, we were able to interview community members during the second half of 2011 who still remembered the occupants of the Stone House during the 1930s and ’40s. It was during Mrs. Evelyn Lemley’s period of ownership of the stone side of the Stone House that the family of Edward T. Grim began a lease the property. The Grims would continue to rent the stone side of the Stone House eafter Mildred Lee Grove purchased it from Mrs. Evelyn Lemley in May of 1940. Edward T. Grim was born on 9 June of 1869, the son of David J. and Martha Carper Grim. Edward was born with a condition that is commonly referred to as dwarfism and therefore never grew to the full height that most adults reach. As a little person living in the late 1800s, Edward was certainly subject to the prejudice and social stigmas of that time. His condition may have affected his ability to acquire a trade and to find a spouse. In the 1900 census he is listed as a thirty-year-old “Farm Laborer” who was still living with parents and two younger siblings in the area east of Stephens City around Double Church Road. 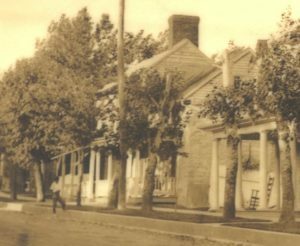 The Grims were part of a large local family of German extraction that descended from John Krim (1755-1840), who came to the area of Stephensburg from Pennsylvania after fighting in the Revolutionary War. He eventually ran a tavern on the Valley Road (U.S. Rt. 11) in the vicinity of Vaucluse south of Stephensburg. Many of his descendants settled in southern Frederick County. Edward had a first cousin by the name of Lucy Emily Grim, who was born 21 April 1881. She was the daughter of Cornelius N. Grim (the younger brother of David J. Grim) and his second wife Lydia Pifer Grim. Lucy was of normal height but shorter than average. Edward and Lucy developed a romantic relationship, and on 16 July 1902 Edward and Lucy were married in Stephens City by the Rev. J. W. Strickler of Trinity Lutheran. On 12 May 1905 their first son Holmes Colmus Grim was born. He was followed on 18 April 1909 by Elmer Edward Grim. During these early years of their marriage, census records indicate that Edward, Lucy, and their sons lived next door to Lucy’s parents in Cedarville, Warren County, Virginia, (the “Pine Hills”) southeast of Stephens City just over the line in Warren County. By the 1920s the family had moved to a rented property in the area of Headquarter Lane off of State Route 735. In the 1920s Edward and Lucy had two more children. In 1921 they had a son named Robert R. Grim, and on 31 August 1923 they had a daughter named Frances Grim. In the 1930 census record Edward is listed as a house painter, and his sons Holmes and Elmer were listed and farm laborers. It may have been the hardships of the Great Depression that influenced their decision to move into town. By the recollections of former neighbors and family the Grims moved into the stone side of the Stone House property by 1937 or 1938. Incidentally, the earliest photographs of the stone side of the property date to this period when the Grims were leasing the stone side of the house. The Grims would lease the stone side of the property until the early 1950s. Edward passed away while he was living there in 1946. Elmer who had married earlier apparently never lived there. Robert, who served in World War II, also married, but his first wife Catherine passed away in 1943. Frances also eventually married and moved out. Holmes was the only child of Edward and Lucy who inherited his father’s genetic condition of dwarfism. He continued to live with his mother after his father passed away at the Stone House property. Holmes never married. He worked a number of jobs during his life including stints as a farm laborer and gas station attendant. He passed away in 1959. His mother Lucy died a year later in 1960, and her remains were buried next to those of her late husband Edward, her son Holmes, and her late daughter-in-law Catherine in the Grim family plot at Stephens City’s Green Hill Cemetery. Elmer would join them after his death on 14 April 1967, as would Robert when he passed away in 1975. Frances died on 2 September 2011 in Winchester, Virginia and was the last of Edward and Lucy’s children to be interred in the Grim family plot at Green Hill.